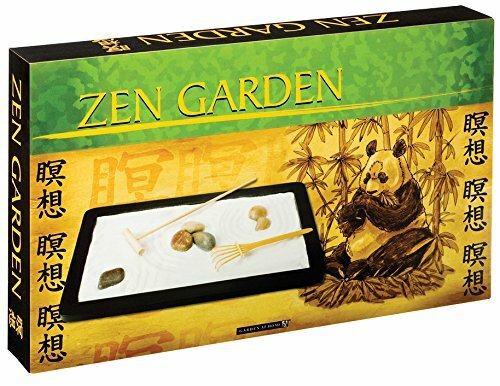 Cultivate inner peace with the Toysmith Zen Garden. The Zen Garden is a version of the traditional Japanese meditative garden done in miniature, suitable for home or office. The garden is contained in a handsome 11.5-inch by 7-inch wood frame, perfect for desk or coffee table. The garden set includes two natural finish rakes to create meditative patterns in the sand. Assorted polished stones provide visual interest and a counterpoint to the garden’s serene patterns. The set includes a meditation booklet with useful instructions and suggestions for shaping the garden.The Zen Garden is a version of the traditional Japanese meditative garden done in miniature, suitable for home or office. Assorted polished stones provide visual interest and a counterpoint to the garden’s serene patterns.